It's the place for clam chowder, championship sports teams, and family-minded ducks. 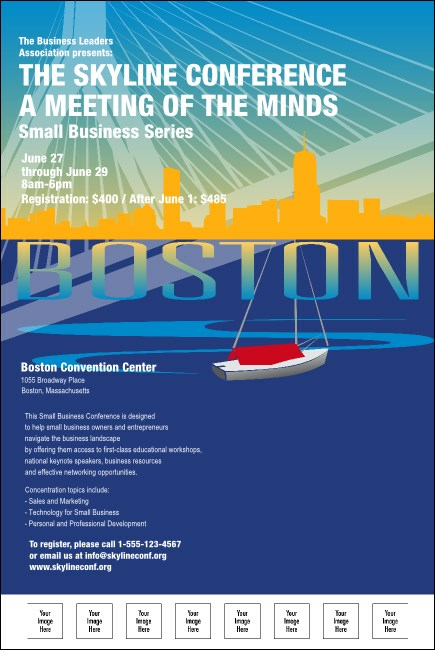 It's Boston, Mass., a jewel of historic New England and home to your organization's next big event. Gather folks in Boston with the Boston Poster, with an image of the city's skyscape and the Bunker Hill Bridge. This poster template lets you upload eight custom images. Not quite right? Browse TicketPrinting.com for lots of local ticket printing and templates.